We’re all used to earning loyalty points for shopping more, but the leading beauty subscription service, GLOSSYBOX, have taken the concept to an exciting new level. And we’ve worked with them every step of the way. Starting today, GLOSSYBOX – who sell one beauty box packed with luxury cosmetics and lifestyle products every 12 seconds! – will be rewarding their customers with GLOSSYdot loyalty points not just when they spend more themselves, but also when they convince their friends to sign up via their brand new referral programme. It’s a really clever idea – especially since, given GLOSSYBOX’s subscription model, there’s little room for existing customers to increase their personal spending. But there is enormous scope for them to spread the word and get their friends spending, too. And that marks a new era for loyalty. Where it’s traditionally been one-to-one (brand to consumer), it can now be one-to-one-to-many: brand to consumer to all the consumer’s friends. And, rather than spending a fortune on a new loyalty points system, GLOSSYBOX and other brands can simply use the Buyapowa rewards engine to do all the heavy listing with absolutely no development overheads. It’s a win for the customer. It’s a win for their friends. And it’s a massive win for the brand. 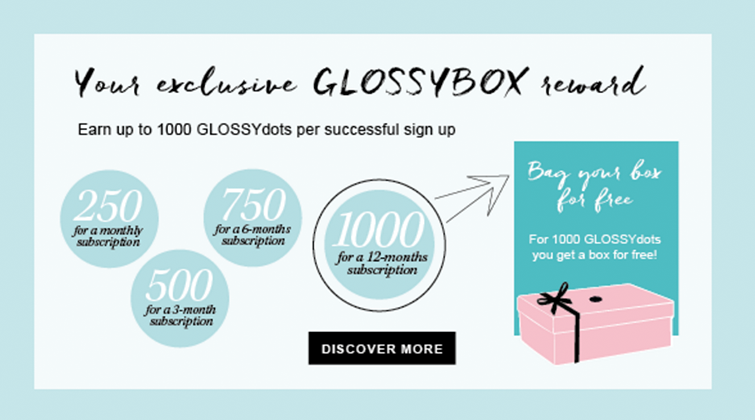 Take a look at GLOSSYBOX’s exciting new subscriber-get-subscriber programme. And, if you’d like to extend your your loyalty programme with something similar – or if you’d like to learn more about referral marketing in general – we’d love to hear from you.